The 7.5" aluma style Strongback Channel is generally used in vertical wallform, as a pair, back-to-back, connected via a Steel Tie Plate. 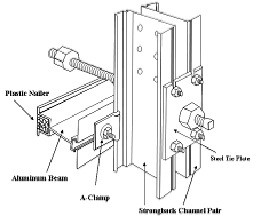 Through the center of the Tie Plate is a through-the-wall bolt arrangement that secures both wallforms in place. Given its strength, the choice of the Aluminum Strongback minimizes the total number of members required on the job compared to wood. Since aluminum is lightweight compared to steel, the contractor realizes labor productivity through ease of use. The Strongback has been the choice of cost conscientious contractors who have 'weighed' all the alternatives. 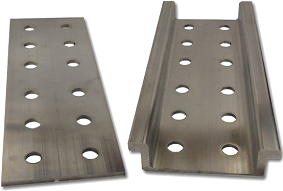 Lightweight Aluminum Strongbacks support Aluminum Beam in vertical shoring as they tie the entire support system together. 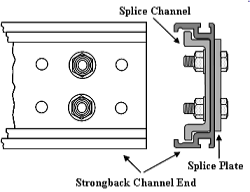 Strongbacks are made to be held in back-to-back pairs via a Tie Plate, and lengths of Strongbacks are connected via a pair of parts: the Splice Channel (slipped inside the Strongback Channel), and a Splice Plate (on the back of the Strongback Channel). 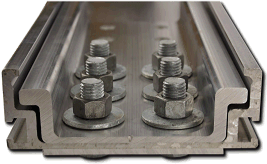 Strongback Channels are used back-to-back and held together via a Steel Tie Plate. The Tie Plate has 4 slotted holes so that easy-to-use self-locking A-Bolts can lock the Strongback to the 4 corners of the Tie Plate. The center hole of the Tie Plate provides the means to tie this wallform to the facing wallform via a wall tie. The heavy gauge of the Tie Plate guarantees the strength required to hold Strongbacks together. Strongback Shoes are used to protect the bottoms of the Strongback Channel from abrasion and beating. The Shoes protect the Strongback ends so that repeated use does not preclude future splicing due to damage. Strongback Shoes are accurately slotted to bolt to the first pair of holes in the Strongback Channel. Once bolted, the Shoe will extend slightly further than the end of the Strongback, thus protecting it from damage.